ATC-SD is currently developing new models of laser diodes and arrays, laser devices and solid-state lasers. Below you can find brief information about our new products, which now are under development. Development of the new products are implemented with the support of Foundation for Assistance to Small Innovative Enterprises (FASIE, http://www.fasie.ru/eng/). ATC-SD presents high power laser emitting device. 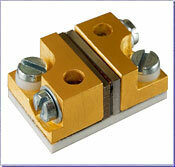 It consists of two serial connected laser linear arrays, mounted on a common heat-sink. The peak output optical power of this laser emitter reaches 100 W, and it may operate at heat-sink temperatures of up to +55°C. The main fields of application are pumping of solid state lasers and material processing. Special design of the laser linear array allows operation at the heat-sink temperatures of up to +70°С. The main application of these laser arrays is in manufacuring of diode pumped solid state lasers with the emission wavelength of 1570 nm - safe for human eye - for special purposes, including civil and military range-finders. New medical device for photodynamic therapy based on super light LED's - model "Fara"
ATC-SD offers a new device for photodynamic therapy based on super light-emitting diodes. Name of the device is “Fara”. This devise appropriate for photodynamic therapy of surface neoplasms. Also, the system can be used for fluorescent monitoring. The device is made on the base of high-brightness light-emitting diodes with high reliability and durability. LEDs radiation on the exposed surface gives light spot with a minimum diameter of 6 cm. ATC-SD presents new DPSS laser with wavelength 473 nm (blue light). As a pumping source, used laser diodes produced by ATC-SD’s own manufacture facilities. This laser has air cooling by Peltier thermocoolers. Solid-state lasers are air-cooling and built-in thermostabilization system based on Peltier thermocoolers. 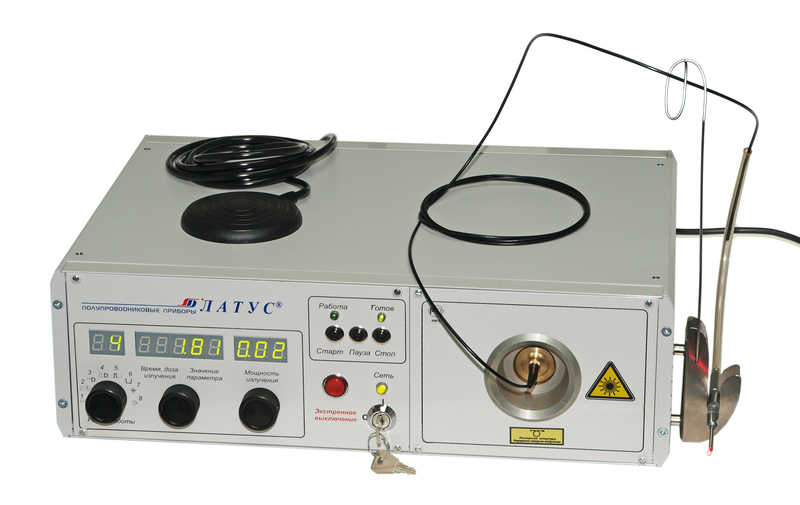 As a power source for such lasers used LDD-10 driver with an additional thermostabilization system. ATC-SD presents new laser medical device model Latus-5 for photodynamic therapy. Laser device model LATUS-40 For medical and technological applications.